Vietnam head coach Park considers focusing on just one team. January. 30, 2019 08:13. by Yun-Cheol Jeong trigger@donga.com. Vietnam head coach Park Hang-seo has indicated a change in his status. It is because he is having too much on his plate while directing both the national team and the Under-23 team. “I experienced increased workload (as I was in charge of two teams) and had to attend the next game immediately after one, which is becoming a problem,” the head coach said Tuesday. "I need to select and focus. We are discussing this within Vietnam as well." Leading the two national teams since October 2017, coach Park wrote a new history of Vietnam soccer. 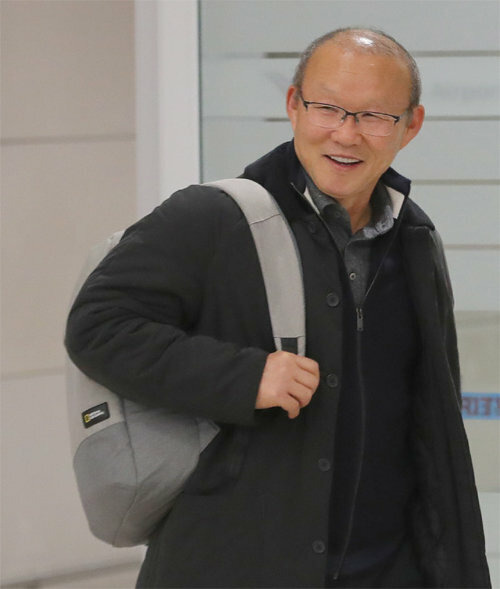 After finishing the AFC Asian Cup held in the United Arab Emirates, he came to Korea to spend the forthcoming Lunar New Year holiday in his home country. “It has been a long time since I met my family,” said Park, adding that he is planning to meet his 96-year-old mother. Even to Park who had raised Vietnam’s soccer competitiveness through the AFC U-23 Championship (second place), the Asian Games (semi-final), and the Suzuki Cup (first place at the Southeast Asia games) last year, the Asian Cup was a burden on his shoulder. “I was worried as we did not have enough time to prepare for the Asia Cup early this year after finishing the Suzuki Cup, which was held last December," the head coach said. "Even though Vietnam did not seem to have much expectations (on the Asia Cup), the media started to criticize when our team lost two games at the group league. Fortunately, all the criticism went away when we won. It is just the way it is." After defeating Yemen at the group league finals, Vietnam dramatically advanced to the round of 16 and won Jordan at the penalty shootouts. “I had a lot of luck. Players, who devoted everything to the Suzuki Cup, lacked motivation and sense of purpose for the Asia Cup,” explained coach Park. "Players, who were tired physically and mentally, did not respond promptly to messages I sent. I am glad that we achieved our goal." Team Vietnam is awaiting a friendly match with Korea (National Team A) and 2020 Tokyo Olympic trials (National Team under 23 or younger) in March. “Would Son Heung-min participate in the friendly match with Vietnam? No,” coach Park said while he made a remark about the friendly match with Korea. "As many players of Vietnam’s national team need to prepare for the Olympic trials, it would be difficult to organize the best team."